Vidmantas Tomkus received an MS degree in Physics at Vilnius University. Starting in 1985, he has worked at the Semiconductors Physics Institute of Academy of Sciences of Lithuania. From 1994 until the present time, he has worked at different positions in telecommunications and satellite industries such as CTO at Radio M-1, CEO at JSC “Dicto Citius” and JSC “Arcus Novus”. 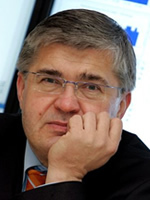 In 2007, he was assigned as an Expert of Inter-ministerial Working groups of the National Space Program, Integrated Programs in ICT, Mechatronics, Lasers, New Materials, Strategy of Research Infrastructures of Lithuania, Member of Council of Semiconductor Physics Institute and Chairman of National Space Technology Platform of Lithuania. Since 2009, Vidmantas Tomkus has served as a director of the Lithuanian Space Association and deals with the promotion of space-related activities of Lithuanian R&D institutions and SME’s, co-operation with the European Space Agency, bilateral relations with national space agencies and companies working in the space industry. In 2010, he was assigned as an EC Committee FP7 Space Expert.